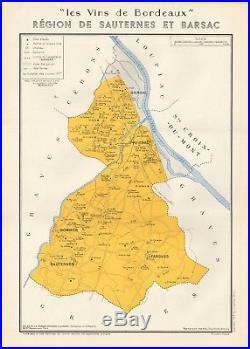 1949 WINE MAP-FRANCE-VINS DE BORDEAUX- REGION DE SAUTERNES ET BARSAC. Dated outside the frame. Large, highly colourful, good margins, ideal for framing. Detailed large, highly decorative map with original colour. Scarce and collectible map. Folded map with folds as issued, printed one side only. Page Size: Approx 44 0 x 310 mm, (17.25 x 12.25 Inches). Provenance: Atlas de France Vinicole, Les Vins de Bordeaux, by Louis Larmat, Paris 1949. Condition: Please look at the picture provided. GUARANTEED genuine vintage print. The picture included here is of the actual print for sale, not a stock or library picture. The vast majority of prints we sell are recovered from old, disbound books, atlases and magazines. Virtually all antiquarian maps and prints are subject to some normal aging due to use and time which is not obtrusive unless otherwise stated. We endeavour to describe any faults but please look at the picture. This is an authentic print, published at the date stated above. It is not a modern copy. The item “1949 WINE MAP-FRANCE-VINS DE BORDEAUX- REGION DE SAUTERNES ET BARSAC” is in sale since Wednesday, December 13, 2017. This item is in the category “Art\Art Prints”. The seller is “historyinprint” and is located in Holmfirth. This item can be shipped worldwide.